The plaza outside the Cheyenne Depot Museum is a cool place for a modern wedding ceremony. The groom was always a fan of trains since a young age. He was given train sets as a kid, and even had a replica of the train depot itself. So having it as a backdrop when they got married fit really well for them. Since Wyoming is typically known for its wide open spaces, it is unique to have an urban wedding ceremony in the state. Since Cheyenne is the biggest city, Depot Museum is the place to do it! After the ceremony the groomsmen and I gave the ladies a break by going off for the guy shots. I loved the colorful red building with the famous Wrangler sign. It reminds you right away that you are still in Wyoming. 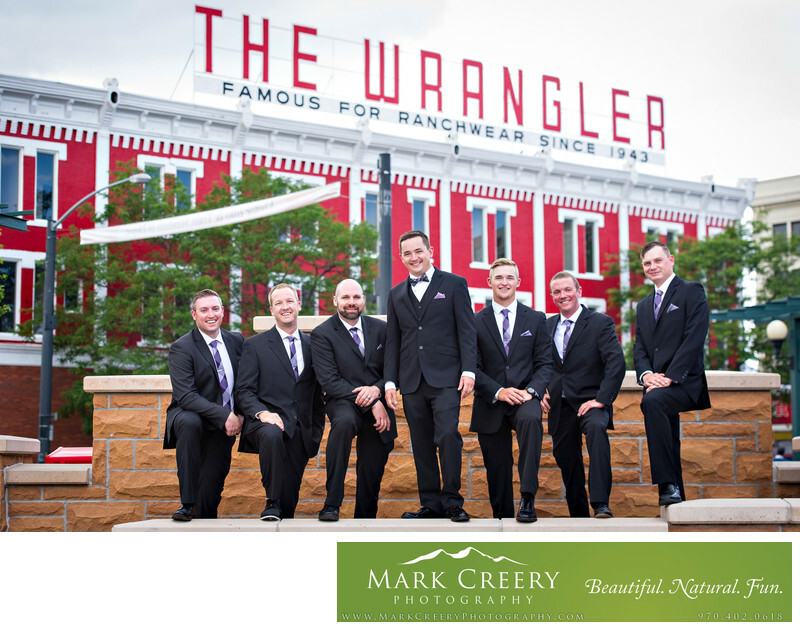 Since the groom was shorter than some of his groomsmen and I wanted to feature him more prominently, I had him stand on a small wall. This gave him the stature he deserved as the groom. I also achieved this look by getting down low, thereby minimizing any distraction in the background as well. Fun fact: the Wrangler building on the corner of Capitol Avenue has had a retail capacity since its erection in 1892! The building now houses a ton of ranchwear and Western clothing. Cheyenne Depot Museum is located in Cheyenne, Wyoming. Contact: (307) 632-3905. Location: 121 W 15th St #300, Cheyenne, WY 82001.